Last night as I cycled home, it started spontaneously changing gears all by itself. Then when I did change gear, it didn't. There were wierd clicking noises from the back wheel and when I got off to look, the chain placement didn't match the gear I should have been in. I think it was the spontaneous gear changing that was most worrying as it wasn't a smooth transition, more a sort of great jolt which nearly threw me off the bike. The gear transition has always been a bit ropey, but this having a mind of its own is something else entirely! I've handed the bike over to Dave to take to the bike shop and naturally, today I drove to work. Ironically, I don't have a lot of petrol in the car just as there are some strikes effecting the delivery of petrol to forecourts... The fuel gauge has been low for a week or so, but since my car use has dropped considerably over the past few weeks I'd been eeking it out. Tonight I shall endeavour to buy fuel... I just hope no one is panic buying out there! 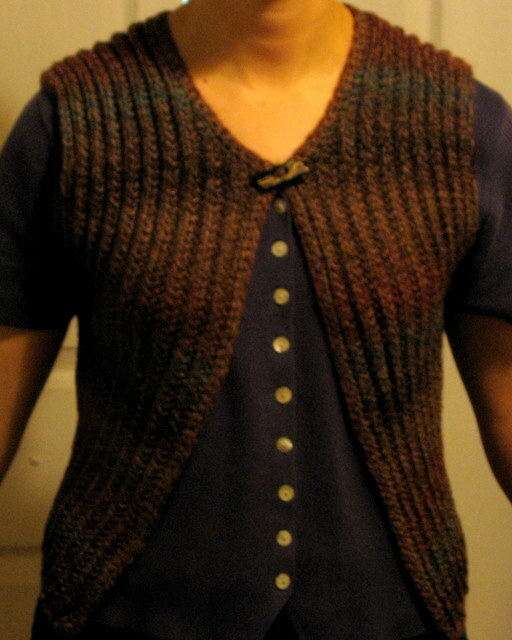 I finally got around to sewing the button on my first attempt at a waistcoat and I now declare it finished. 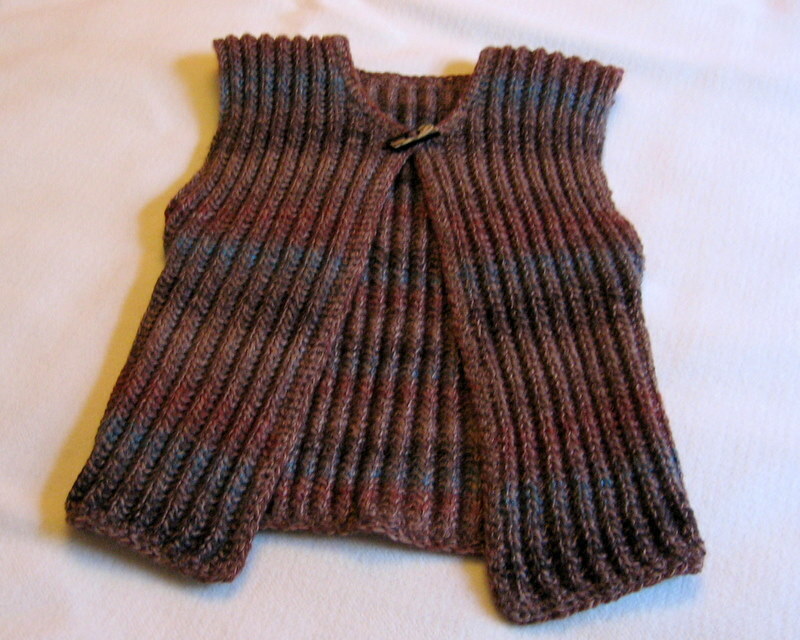 For those who need to know these things, this is the Simple Mistake Rib Waistcoat (that's a Ravelry Link), taken from 101 Designer One Skein Wonders. I knitted it up in the smallest size to fit a 34" chest (i.e. me, I am ickle) out of James C. Brett's Marble in DK. Having added a crochet border and given it a light pressing with a cool iron I've decided it does fit after all. 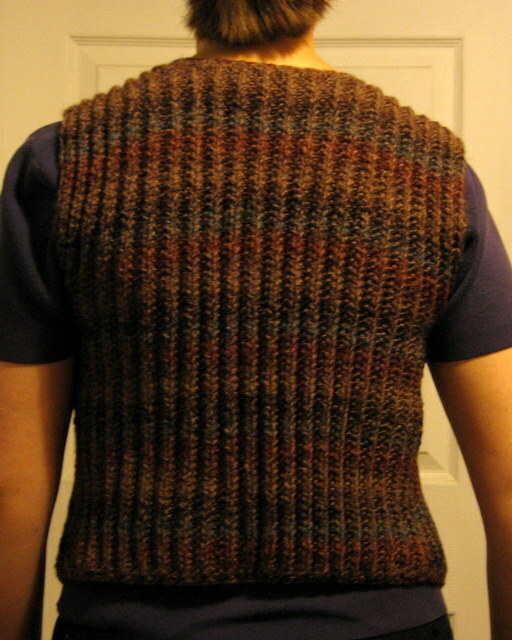 The waistcoat has a lot of negative ease and I think it is supposed to sit like this. Having looked at it in the mirror, it looks 'right'. Not exactly what I was expecting, but certainly wearable and it may grow on me come the cooler weather when I start wearing it. I'm still pleased with the seams on this and I like the way the crochet border gave it some shape, adding stability to the whole thing. If I make it again, I'll either make it in a larger size or add a few stitches at the front to reduce the negative ease just a little. All in all, I'm pleased and glad I made it. 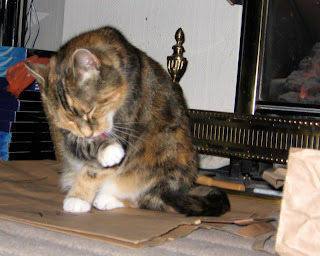 Now, in response to those who said I'd never posted pictures demonstrating my cat's love of paper bags I refer you back to this entry. See? Completely mad for them! And to prove the cats still enjoy their paper bags and take turns* sitting on them, here are the cats yesterday, pictured seperately. 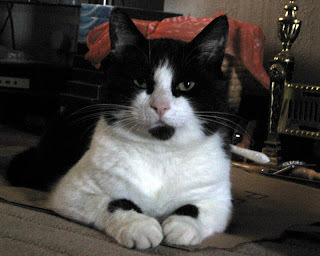 * NB Taking turns meaning they squabble and chase each other off the paper bags if one catches the other on them; as sitting on them or playing with them is a very desirable thing indeed. Another week has gone by in a blink of an eye and the weekend is upon us once more. Tomorrow (Saturday 14th June) is World Wide Knitting In Public Day and we will be having a picnic in the War Memorial Park, Coventry. Knitters and crocheters are welcome, along with their significant others, hangers on and children. Just bring a dish to add to the picnic and something to sit on as well as your knitting/crochet (of course). They are panic buying fuel near us, Asda is only selling diesel and queues are forming at others, I still have full tank so will be fine for a couple of weeks well past the strike. The bike thing just sounds like a cable adjustment, I hope, but I'm no expert. Have a good World wide knitting day. Your bike is now fixed. Yay! Wish I'd have read about the knitting day earlier, sigh.